The word April means “crazy time” to a farmer! Imagine that you are about to host a dinner party for 275 of your closest friends. You would have to plan the meal, buy (or grow) the ingredients, find the right recipes, make creative place cards for everyone, organize the kitchen, get all the matching silverware, so on and so forth. Now, imagine being in that kitchen right before you start cooking. You know what you need to do—or at least you have a plan—but you don’t even know where to start there is so much to do. For me, this is close to what I feel on the farm every April. A special blend of excitement, nervousness, positive energy and hope fill my belly each day as I head out into the fields and stare down the large task that awaits me (oh, and did I mention, a dash of panic in there, too?). So, I begin following the plan that I constructed over the winter months, trying to trust that I really did mean it when I said I wanted to grow over 14,000 heads of lettuce this season. The fields need to be plowed and disced. 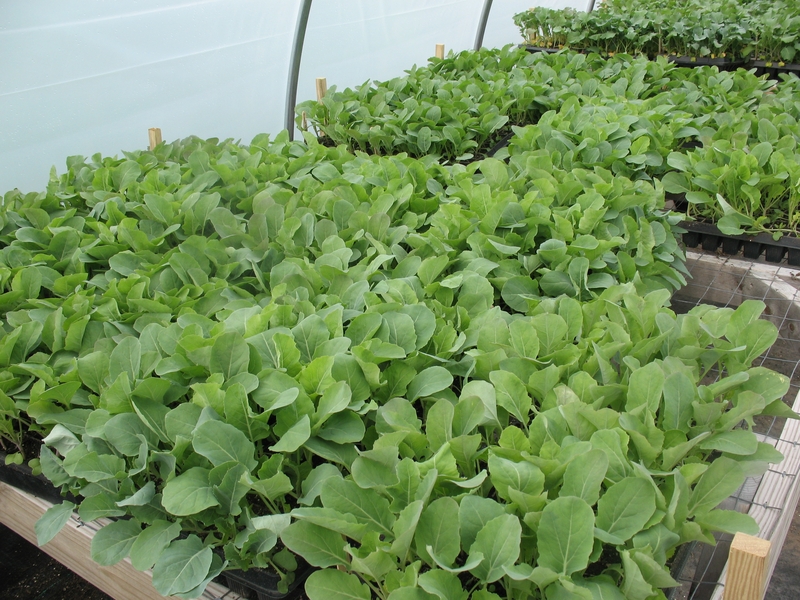 Seedlings must be moved from the warm womb that is the greenhouse out into windy cold frames in preparation for their lives in the fields. The new farm crew must become acquainted with the farm systems, which may often come across as quirky and hard to explain, and some must learn to drive tractors for the first time. Deer fences must be erected and chickens must be chased from the neighbor’s yard back to their coop. And, finally, beds must be made for planting. Yes, planting. This one is a particular favorite of mine. This week we planted our first carrots, beets, scallions and hakurei turnips, which are my absolute favorite, sweet, tender salad turnip! Pushing the beet seedlings into the soil with both hands, moving swiftly from plant to plant, I feel connected and grounded. The rhythm of planting calms my thoughts as they swirl around my head, telling me all the work there is to do and what should be done next. Four hundred feet later, I have planted 800 beets, enough for about 300 bunches of beets on our farm. So, I’ve started cooking that ‘big meal’ that is the farm season. The kitchen is pretty messy right now, as I get used to being in it again, and I learn to make room for all the new cooks helping me with this project. But, I know that all this work will make for a fabulous party! This entry was posted in Public Radio Kitchen on April 27, 2010 by . As a CSA shareholder I must tell you our family can not wait until the party starts!